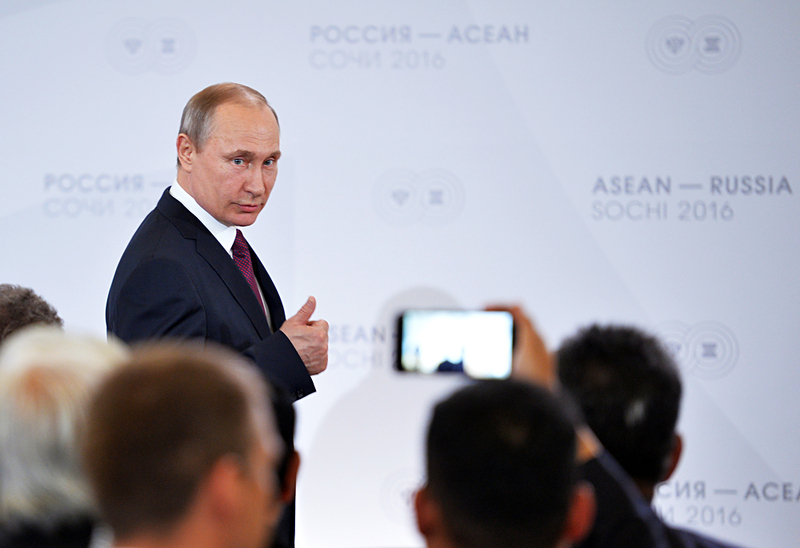 Russian President Vladimir Putin gestures as he arrives for a meeting with businessmen on the sidelines of the Russia-ASEAN summit in Sochi, Russia, May 20, 2016. The U.S. has deployed missile defense elements in Romania. The U.S. is eroding the Intermediate-Range Nuclear Forces Treaty (INF Treaty) by deploying launchers that can be loaded with intermediate-range missiles as an element of its missile defense system in Europe, Russian President Vladimir Putin said. "The fact that they are deploying launchers that can be loaded with intermediate-range missiles is nothing but the erosion of the Treaty on Intermediate-Range and Shorter-Range Missiles by our American partners," Putin said at a press conference following negotiations with Greek Prime Minister Alexis Tsipras on Friday. The U.S. has deployed missile defense elements in Romania, Putin said. "What are these? These are launchers and radar stations. Now they are deploying missiles with the range of 500 kilometers, and several years later these will be missiles with the range of 1,000 kilometers," he said. Moscow even knows roughly when these missiles are to be deployed, and this poses a threat to the Russian nuclear forces, he said. "But what is worse is that these compact systems can be loaded with attack missiles already now, and this implies the range of 2,400 kilometers, and it doesn't constitute any problem to replace one missile by another. It's enough to replace the software, and nobody will even notice this, even the Romanians," he said. The U.S. earlier rationalized the deployment of missile defense elements in Europe by a nuclear threat from Iran, Putin said. x"I'll remind you that the matter originally implied the prevention of the threat from Iran. The matter implied the Iranian nuclear program. Where is the Iranian nuclear program now? There is none. The U.S. itself was the initiator of an agreement with Iran. The Iranian nuclear threat doesn't exist, but the U.S. is setting up a missile defense launching area in Europe," he said.